Woah! Where did this project come from? Totally out of left field here. Well...not really. If you follow me on Instagram then you've already seen a few photos of this project while it was being knit up earlier last month. This project had knit up surprisingly faster than I thought it would that I didn't have the chance to blog about while I was working on it. 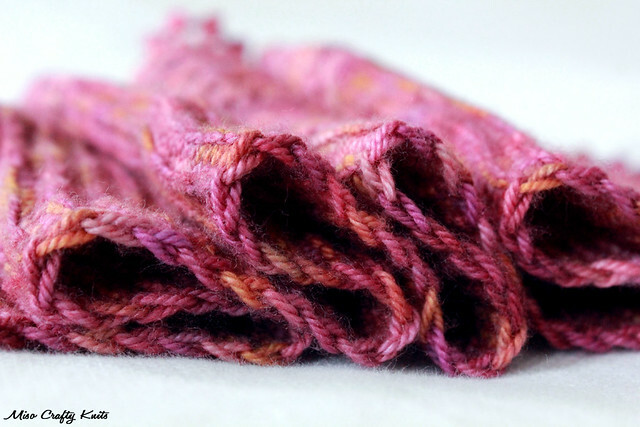 You're probably wondering why then, did it take me so long to blog about this FO? Photography. I simply couldn't find the right time to take photos. I'm sure a lot of you can relate. So without further adieu, let me introduce to you my Autumn Suncrest. 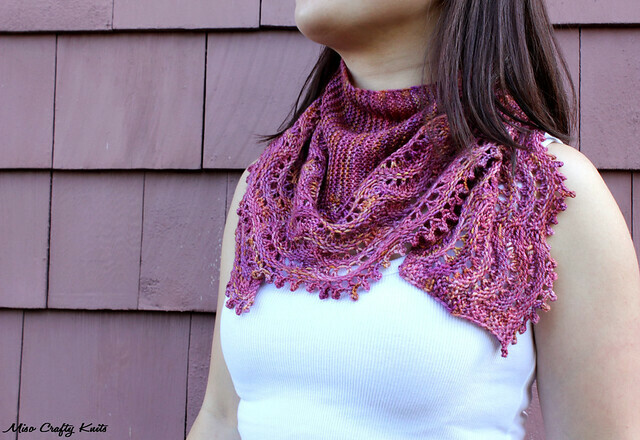 This shawl was designed by Tanis Lavallée of Tanis Fiber Arts and is one of four beautiful shawl patterns featured in The Stella Collection that Tanis and fellow designer, Julie Crawford (of Knitted Bliss) collaborated on together. The collection was released in June and I believe is currently on a blog tour still, which you can find out more about on Tanis' blog. I drooled when I first saw photos of the collection on Tanis' blog. The entire collection is so stunning that I had quite a hard time trying to decide which pattern to pick up first. Luckily the agonizing decision was made for me (thank you Tanis!! ♥ ) But then I had quite the time trying to decide which pattern to knit first! Aiya! I had tossed the stash and came up with the perfect yarn for each design and then spent an entire day hemming and hawing over which pattern to go for first. Eventually I had to just lay the skeins of yarn out in front of me, close my eyes and picked one at random. The Suncrest shawl was such a fun and (very!!) addictive knit. I've never knit a multi-directional shawl before and I can say this definitely won't be my last! When I had cast on I thought I was just getting the project up and going for when I go on our first family camping trip. I should have known better that I wouldn't be able to put down cushy garter knitting! Even though I got gauge with the recommended needle size, I decided that the garter wasn't going to block and open up as much as I would like it to. So I went up a needle size (much better!) and I think the garter knitting went by even faster! If I thought the garter portion was addicting, than the Fan Shell border was even more so. I seriously could NOT put it down! And when I did, I couldn't stop marvelling at how beautiful it was. I kept spreading it out on my lap, taking photos of it, and generally just admiring its intricate beauty. Once I got the hang of the design the knitting kind of became intuitive and I only had to refer to the pattern whenever the Munchkin was around (you Moms out there know what it's like to be interrupted every 10 seconds!). I've also never knit a picot bind off before and even though it felt like it took forever to do, the end result is definitely worth it! Even the handfuls of pins during blocking was well worth the time. But do you want to know my most favourite part of the entire shawl? The top edge along the garter portion. I love how squishy garter can be but the one thing that I don't like is how messy the edges can sometimes look. I'll admit that I'm not really a big fan of how bumpy it can get but will tolerate it because I never knew just how to clean it up. Thanks to Tanis and this simple yet very effective detail, now I know! 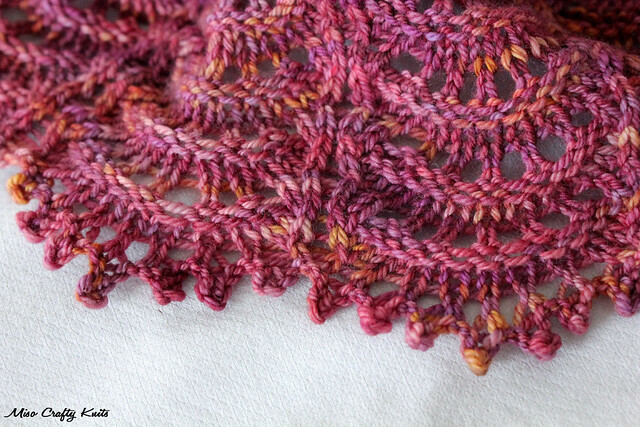 I absolutely love how the clean edge adds even more class and really polishes up the overall design of the shawl. I can't wait to use this technique on future projects that involve garter stitch! I'm going to confess right here, right now that when I started knitting this shawl I was thinking of gifting it to a friend. But after blocking I decided to keep it for myself. I wish I could say my reasons are solely selfish, but really I'm just scared that the recipient won't be able to take proper care of the shawl when it gets dirty and needs to be cleaned. Am I the only one who thinks this way? Even though I know she would hand wash it, I'm not so sure she would know that she would need to do more than just lay it flat to dry. Would she take the time to re-shape the shawl? Would she spend 15-20 minutes or so pinning each and every individual picot tip? I'll admit that I've never blocked anything scallop shaped before and think I was a little overly agressive during the stretching and pinning process, because as you can tell in the photos (versus the pattern photos) my scallops aren't so curvaceous as they could be. 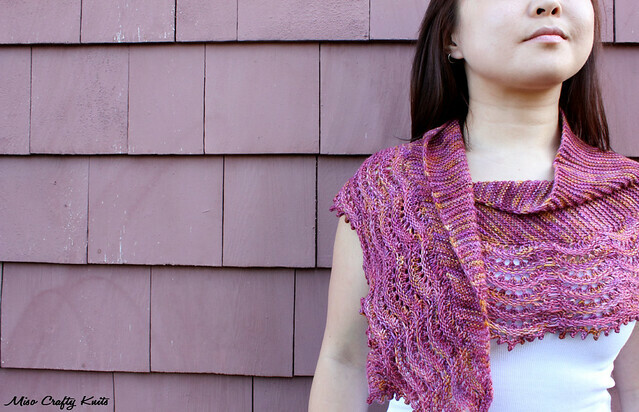 I'm tempted to re-block the shawl and try to get a more curvy border. So you see, if I couldn't get the blocking right, and I'm a knitter who has blocked quite a lot of hand knits, would a non-knitter know what to do? You see my dilemma...right? Here's another confession: this is my first time knitting with Tanis Fiber Arts. I know, how crazy is that? Especially considering that I have a nice little collection of TFA in the stash and enough on hand to knit up a few cardigans or pullovers. I used the Purple Label Cashmere Sock for this shawl since I really have this thing against using luxury MCN yarn for socks (weird, I know). I was a little hesitant about the colour though. The colour you see here is Autumn Sun, last September's Year in Colour Club colourway. I was a little nervous that maybe it was too variegated and that it would take the attention away from the Fan Shell pattern, but I don't think it does. Do you? 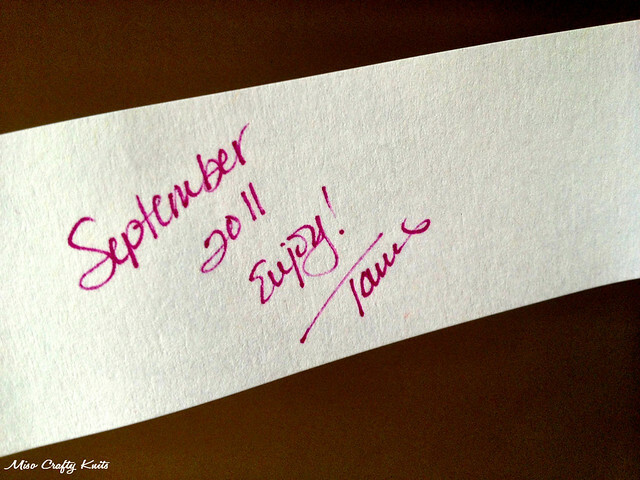 Wow...a little handwritten reminder written by Tanis herself! I totally appreciate the little things like this that dyers do and I think it shows just how passionate they are about what they do. I mean, can you imagine having to handwrite this more than a hundred times?? My hand is cramping just thinking about it!! Anyhoo, back to the yarn. I have one word for it: YUM. It was so squishy soft that it really made the cushiness of the garter stand out. A lot. Having this shawl wrapped around your neck is like getting hugs from springy little goats and fluffy sheep (minus the smell). If it weren't for the heat, I think I would have had a hard time taking this shawl off! The only downfall about knitting with such a cuddly soft yarn is that it really highlights just how dry your hands are! This was pronounced even more when I went camping and brought this shawl along to work on whenever Brett and the Munchkin were having some bonding time. Since I finished this project the weather has been too warm for me to wear it. I kinda can't wait for when it cools down a little more so that I can sport it out. Don't tell Brett I said that though, he's irked enough already that our summer weather had only begun and already it's starting to cool down. That's Victoria for you though! I'm über pleased with how this shawl turned out. I love how it's kinda reversible (when I uploaded the photos I realized that I was wearing it with the "wrong side" showing...I don't think it looks bad at all though. I love how because of the multi-directional knitting, the yarn didn't have a chance to do any weird pooling and the Fan Shell pattern really breaks up any possibility of that along the border. The crescent shape of the shawl makes it, in my opinion, easy to wear. It just wants to wrap around your neck! I'm not at all elegant enough or even able to pass off being able to wear the shawl draped casually over my shoulders without it sliding off my shoulder and most likely fall to the floor every 5 seconds. The pattern itself was beautifully written and was easy to follow. I really liked how Tanis included a little note about picking up stitches and pointed out that there was no right or wrong way of doing it as long as it looks good to you (since your own opinion is what really matters!!). I know that sometimes when I knit a pattern I'm not quite sure which technique to use to execute the pattern just right, so it was nice to get a little reassurance from the designer. I also liked the note about what to do if you don't pick up the exact amount of stitches needed to continue on the pattern. Again, I know you can start cursing up a storm and wonder what kind of glue the designer was sniffing when your stitch counts are way off from what the designer requires you to have. So a little "hey, it's ok! Just fudge it - no one will know but you" is really helpful and eases the mind a bit. And the one thing that I really appreciated? The photo of the shawl blocking. Since I've never blocked this kind of a scalloped border before or even a picot edge like this, it was nice to have a photo to reference. I highly recommend this pattern to anyone who wants to try their hand at a little lace work that isn't overwhelming. I think even a beginner who knows how to pick up stitches could even whip this up. I thought the layout of the whole e-book was very well done, was thoroughly thought out, and flowed perfectly from one pattern to the next. I find that sometimes when designers collaborate the patterns within the collection are a bit choppy in the sense that they really aren't cohesive and look a bit random when it comes to the writing. I love that Tanis and Julie included both charts and written directions for all the lace designs. I'm contemplating on knitting this pattern again. The friend that I had in mind for this, I still think would look great in it. Hmm...I just need to get over my fear of having my hand knits being cared for by a non-knitter. I wonder if I included very thorough washing and blocking instructions if that would ease my mind? What do you think? 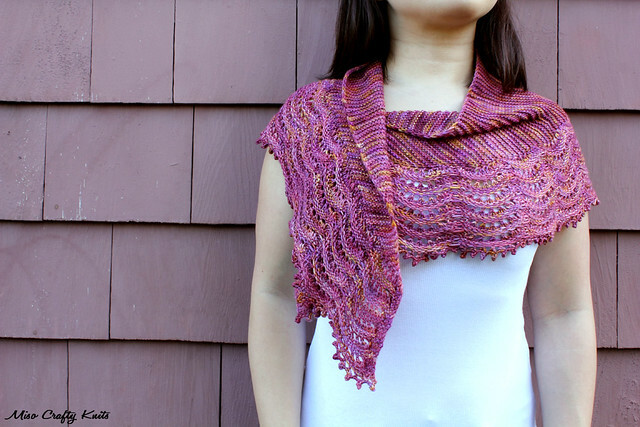 Your finished shawl looks absolutely fantastic! I am thrilled to hear that you were so pleased with the TFA experience! 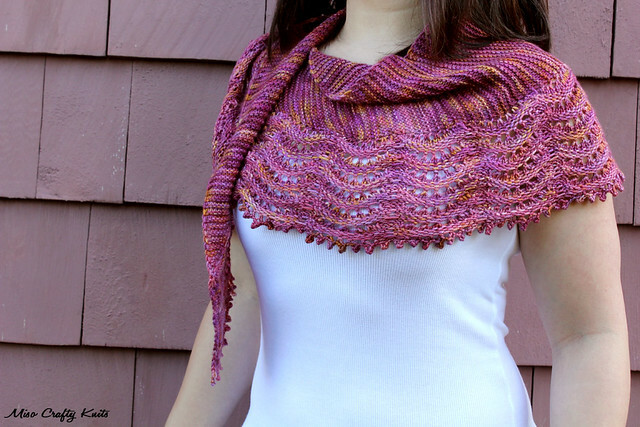 Enjoy your new beautiful fall shawl! giving away your handknits is like giving up a baby. worse, maybe. if they know nothing about yarns and fibers they can't really know how to take care of them, or even be expected to. so they would treat the garments the same way they would treat something they bought from a store (with 99% acrylic content) without any clue what machine-washing can do to so many fibers. knowing all this in the end it would seem such a waste (at the risk of sounding horribly selfish & patronizing) to use precious fine yarns and so many hours of work when you can't be sure the finished garment gets the care it needs and deserves. and as for blocking, none of my non-knitting friends know what it is and why it matters. so with lace what happens is i need to go back and re-block it for them. not nice. so i've kind of shifted towards only making socks and simple scarves that don't need any maintenance after washing, just so they won't need to worry, and i won't need to do the same work all over and over again. so in short, i totally get you. and the scarf is gorgeous, i wouldn't let that one go either! I thought about knitting socks for others but since feet gross me out, I never know how big/small to knit them! So I just don't. mailbox.. as in your ravelry mailbox, you've been using your iphone again missy! you'll get your presents in a couple of weeks :) speaking of which, felicia says hi & hopes to see us both on sep 10th!